I had a hard time getting into this book. I'm not sure why exactly. My best guess is that Angelfire felt like it took itself too seriously. I think that the tone of YA books is hard to get right: too light and the book has limited crossover appeal, too heavy and the book feels weighed down. The premise of Ellie's reincarnation was focused on really heavily, and that got old for me. I also had a hard time connecting with Ellie: I felt like she was kind of a spoiled brat who always got her way. When faced with adversity she finally rises to the challenge, which really saved the book for me. Ellie's interactions with her dad were some of my favorite parts of the story. I loved how she stands up to him! There is a lot of fighting in this book, something that I think will appeal to a male audience. Fight scenes are not my thing, but these were descriptive without being overly gory. I feel like I would enjoy the next book in this series more, since it will bypass the world-building, which is what usually drags down first-in-a-series books for me. 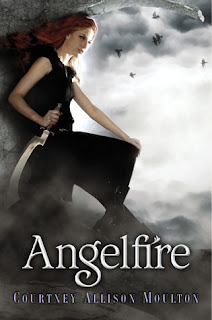 I do think Angelfire was a strong debut, it just wasn't one of my favorites. The fight scenes felt repetitive. The development of the love story. it was heartfelt, tender, and forbidden---my favorite! Hm. I was really excited to read this one, but you make some great points. I agree with you on the difficulties of YA and being too light vs. too heavy and having to find the right balance for a wide range of readers. I'm still giving this one a try, but thanks for your honesty, I always enjoy reading your reviews! Thanks for the honest review. I've been wondering about this one. I agree with Jenny. YA is a balance of both the young adult and adult worlds. You don't want to turn off teens by being condescending, but you don't want it to go over their heads either. Thanks again for a great review! Going to put this one on the backburner for now. Sounds like a bit of an adventure story. I'm disappointed to read that it takes its self a little too seriously - I always view these books as being a light, bit of fun read. Thanks for the review. I'm not so sure that this one is for me. I'm not keen on too many fight scenes!